Subsequent to making this post I found that this house is not only the Oldest Wooden House in Europe, it is also the "The Oldest Still Inhabited Wooden House in the World". I have therefore made a fresh post about it by using text/images from this post and have also added more information/images in the new post. Please therefore view the Latest Post and ignore this post. The house dates back to 11th century and was originally the residence of the bishop of the Diocese of the Faroe Islands. As per local legend the house was initially constructed in Norway, then disassembled, its logs numbered and then floated to the Kirkjubøur where these were reassembled. The house and the big farm around it are called Kirkjubøargarður (King's Farm) and are now owned by Faroese government. Its main portion, called Roykstovan, houses a museum, however a part of the house is still occupied by a local family whose past several generations are the traditional tenant since 16th century. 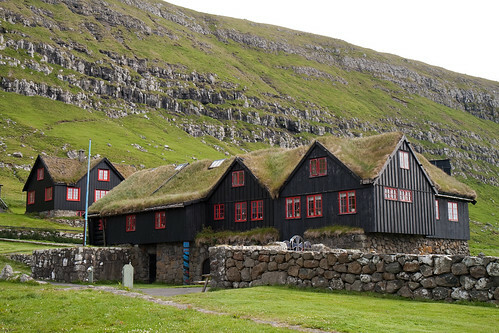 It is interesting to note that although this house and several other houses on the Island have turf roof yet these are a bit different from the turf houses of Iceland. 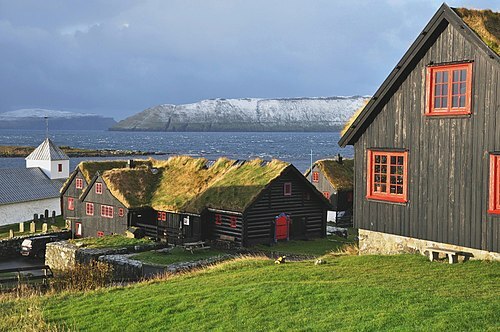 The walls of these houses are made of wood, unlike the houses in Iceland where the walls are also covered with layers of earth and then turfed. Note: Several websites especially those of Swiss origin claim that a wooden house known as Bethlehem House (Bethlehem-Haus) in the small village of Schwyz Switzerland is the oldest in Europe. As per swissinfo.ch and other related websites the Bethlehem House was built in 1287, while the Kirkjubøargarður in the Kirkjubøur dates back to 11th century. The claim that the house in Switzerland is the oldest in Europe, therefore doesn't appear to be correct. It may also be worthwhile to note that the World's Oldest Wooden Building is a five-story pagoda in Ikaruga, Nara Prefecture, Japan, which dates back to early seventh century.